I hope you guys had a great Christmas (if you celebrate it)! I’ve been spending mine with family, taking a good long vacation from work after a very hectic year. One present came early, in the form of the second issue of the newest volume of Daredevil, which brings us to this quick post. Minor spoilers ahead, but I’ll try not to divulge any major plot points. If I was impressed and intrigued – though not yet convinced – after reading the last issue, Daredevil #2 goes a long way to taking care of that last part. We see a plot thickening, the making of a truly creepy villain (with interesting ties to Daredevil’s past), and a burgeoning partnership between Matt and his young protege that I find myself appreciating more than I had originally expected. 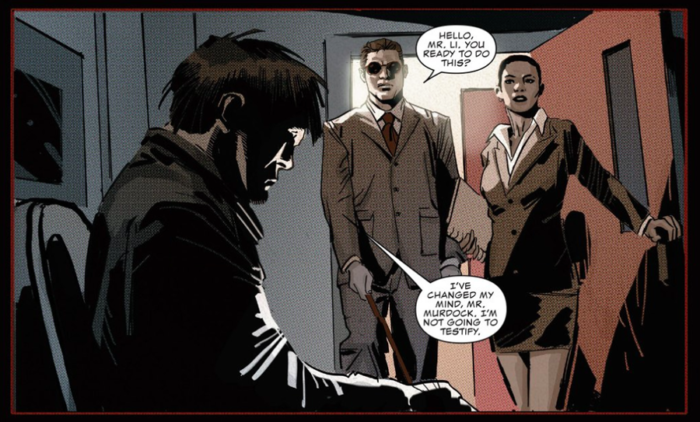 As I mentioned briefly in my previous review, I felt that Soule had found a good voice for Matt, one that lines up closely with my own expectations for how this particular character “should” act and express himself. Daredevil #2 gives us much more to go on from the very first page, with Matt acting in his civilian professional capacity and walking his colleagues through the case ahead of them. We are clearly already getting a lot of mileage out of Soule’s legal credentials, and I’m definitely looking forward to seeing more of this part of the character. One of the reasons I enjoy Matt’s professional life so much, is that it’s a great way to showcase his intellectual abilities. His success as a character, in costume and in the courtroom, owes almost as much to his ability to think and strategize his way out of a sticky situation as it does to his physical training. Soule clearly appreciates this aspect of the Daredevil as well, and makes it a central point for Matt to pass on to newcomer Blindspot, as seen in the panels below. Ron Garney continues to impress with the artwork. 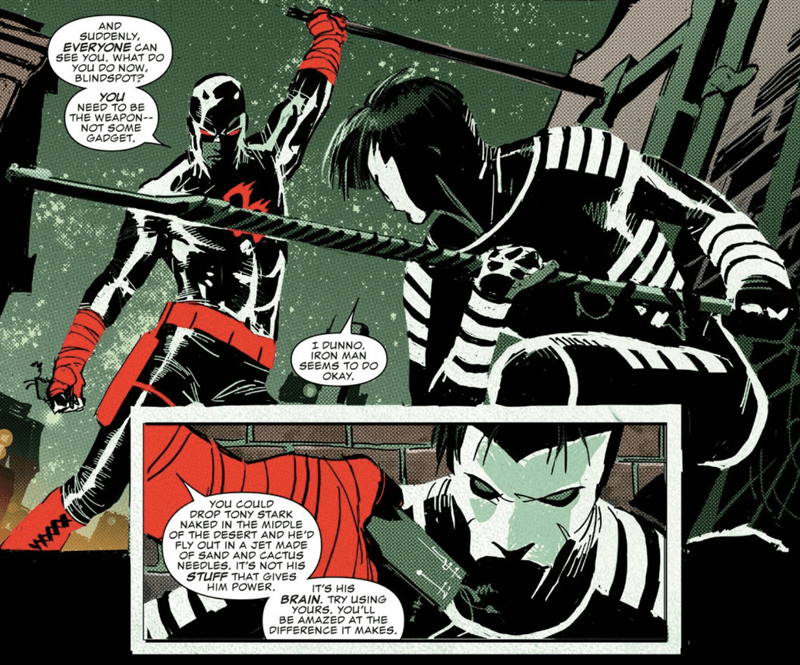 He does a fantastic take on Daredevil in action, and the scenes detailing the world of Tenfingers are appropriately moody and tinged with horror. Garney can – and does – tackle a variety of angles, which makes his pages very dynamic and the flow of the story easy to follow.I know some of you have expressed some objections about the Daredevil’s costume, but while I’m not crazy about the new design for the logo, the rest of it looks quite striking and fits the general mood that this title is clearly going for. The colors, by Matt Milla, are used to great effect with the contrasting of the different scenes and even parts of scenes really adding to the story. I do still have a preference for a bit more natural lighting though, but from a strict artistic perspective, I have no complaints. I’m definitely getting more pulled into the story – and slowly starting to let out the breath I didn’t even realize I was holding – and very curious to see where this is going. I’m not usually a huge fan of stories that take us too far into the realm of magic, but I find that the horror elements exciting enough to more than make up for that. Missing and extranumerary fingers? Yeah, I’m totally down with that. Grossed out, sure, but definitely intrigued. Let’s see where this goes next! I’m holding my opinion as to the new reboot. The series was so dark for so long (decades! ), I’d found that the previous take was like a breath of fresh air with the balance between humor and depression. This one seems to be pulling us back to the dark. However, I am interested in Matt as a prosecuting attorney rather than defense, which always seemed an awkward fit. It was also interesting to see a new twist in his excuse for his bruises rather than the usual “I bumped into something”.